Intel is outlining its plans for the next year or two, and as expected we’re going to see new chips aimed at a wide range of devices including smartphones, tablets, low-cost computers, and high-end devices. The company introduced its first chips based on 5th-gen Core “Broadwell” architecture this fall, but those chips are aimed at low-power, moderate-performance devices such as 2-in-1 tablets. We’ll see higher-performance Broadwell chips in early 2015… and interestingly the company plans to launch its 6th-gen Core processors code-named “Skylake” later in the same year. Intel also plans to replace its low-power, low-cost Bay Trail processors in late 2015. Intel Atom, Celeron, and Pentium processors based on the Bay Trail platform first launched in 2013 and the chip maker plans to continue offering Bay Trail chips through much of 2015. They’ve been pretty popular in Windows and Android tablets and other low-cost computers including notebooks and even a few desktop systems. But while Bay Trail-powered tablets have been competitive with ARM-based models in both price and performance, Intel didn’t really design the Bay Trail platform to compete with ARM-based processors and ZDNet (among others) report that Intel has been losing money while gaining market share by offering chips at low-cost prices. That’s part of the reason we’ve seen the introduction of cheaper, less-power Bay Trail chips like the Atom Z3735 series this year. 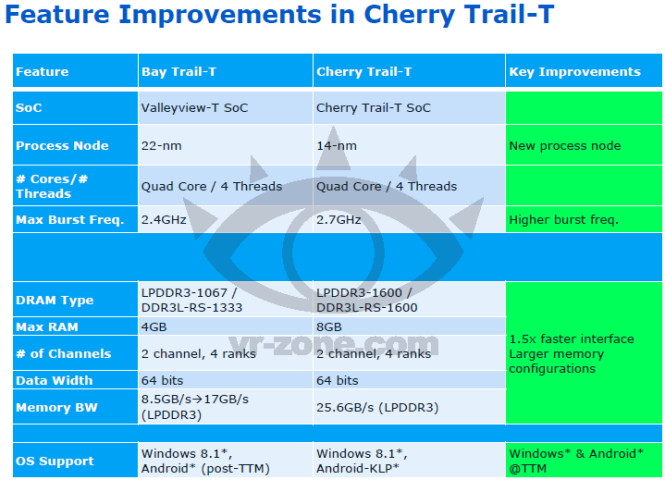 In 2015 and 2016 Intel plans to replace Bay Trail and its phone/tablet Moorefield chips with new Cherry Trail processors for higher-performance machines and SoFIA processors for entry-level phones and tablets. We’ll also see the introduction of Celeron and Pentium “Braswell” chips aimed at entry-level notebooks, 2-in-1 systems, and desktops, while Cherry Trail will be aimed primarily at tablets. Both Braswell and Cherry Trail chips will be based on Intel’s new 14nm Airmont architecture. They should be relatively low-power chips that allow for fanless designs, among other thing. What remains to be seen is whether we’ll continue to see Windows tablets and laptops in the $100 to $200 price range once Cherry Trail and Braswell replace Bay Trail in late 2015. I remember thinking about when fanless laptops/tablets would be hitting the market back in the late 90’s. I knew that eventually things would get so small and consume less and less power, that heat dissipation would become lesser of a need. Now about 15 years later, we’re arriving at that point. I always look forward to Intel’s roadmap and wondering where we are going from here. Is the picture of the chromcast on the sidebar overflowing over the article for anyone else? Whoops. That should be fixed now. Thanks for pointing it out! Are we going to see better memory support from Cherry Trail chips.